Treating neuropathic pain is somewhat different from treating other kinds of pain. For example, in migraine the most common measure used to assess the power of anti-migraine medications is pain free at 2 hours, or pain free at 2 hours and no recurrence of pain for 24 hours. This type of goal is not possible for chronic neuropathic pain. With chronic neuropathic, the primary goal is to maximize the patient’s quality of life. Unfortunately, measuring quality of life is not easy and efforts on Dr. Loftus’ part along with others to launch such a system is going slowly. Please visit BetterQOL.com if you are interested in this subject. A somewhat easier goal to determine is to return the patient to normal function. Normal function does not correlate to “no pain” but generally means the patient has mild pain. Some efforts that reduce pain such as narcotics do not however improve quality of life or necessarily improve daily function. How do the physician and patient decide on the best treatment for his or her chronic neuropathic pain? The best way to decide would be to look at all of the options available for a particular condition and how they compare to each other in a head to head trial. Unfortunately, Dr. Loftus is not aware of a single completed head to head trial between two approved medications for any form of chronic neuropathic pain. There are only medications approved for a few chronic neuropathic pain conditions. Lidoderm®, Lyrica®, and Neurontin® are FDA approved for post-herpetic neuralgia. Tegretol® is FDA approved for trigeminal nerve pain. Therefore, some of the most common neuropathic pain diseases do not have head to head studies available and they also don’t have placebo controlled studies either. Physicians therefore tend to look at medications by classes (common methods for how they work) and try the medications for all neuropathic pain diseases. For an individual patient, the first medication chosen is a balance of factors including efficacy, side effect profiles, and cost. 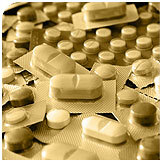 Many patients with chronic pain have conditions for which no medication is FDA approved for their condition. The physician will then have to decide on the most likely mechanism of their pain and then choose the medications he thinks is most likely to work. For example, if someone has painful neuropathy from any condition, Dr. Loftus will use the medications that are FDA approved for any neuropathic pain condition or medications that are closely related. Unfortunately, many groups work to hinder the physician’s ability to do this. These groups include insurance companies (refusing to pay for off label use when no on-label medications are working), FDA (interfering with dissemination of off label use information) and public citizens who feel that off label use of medications in programs such as Medicaid is a violation of federal law. While the FDA is in a difficult position regarding off label use of medications, the net effect is millions of Americans with various chronic pain states who are negatively impacted by their current position.